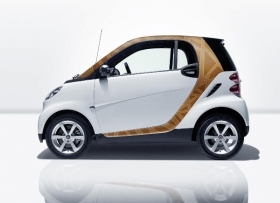 Daimler expects a customization program for paint color choices and body wrap designs will help Smart ForTwo sales. Falling demand for the Smart ForTwo in the United States means the Daimler AG brand likely will sell fewer than 100,000 units of the two-seat minicar globally this year, down from 114,000 in 2009, a German magazine reported. The ForTwo's U.S. sales this year will be about a third of the 25,000 units sold in 2008, Der Spiegel said, without citing sources. Dealers complain they are losing customers because the ForTwo only has two seats, and only two model variations, a coupe and a cabrio, the magazine said. In Europe, the Fiat 500 is winning potential Smart buyers, it said. According to Daimler's numbers, U.S. sales of the ForTwo are down nearly 70 percent to below 4,000 in the first seven months. July sales were 560, down 60.5 percent compared with July 2009. Smart's global sales fell a little more than 20 percent to 8,400 in July, with volume down 17.4 percent to 59,100 in the first seven months. Joachim Schmidt, Daimler's sales and marketing head, said earlier this month that demand will pick up again in the third quarter after the market launch of a face-lifted Smart ForTwo. Daimler also expects Smart's U.S. sales to start improving following the July launch of a customization program for paint color choices and body wrap designs called Smart Expressions. The automaker believes the brand also will get a boost when a test fleet of 250 ForTwos is made available for lease in eight U.S. markets in October, followed by general sale in 40 states next year. Daimler plans to revive the ForFour that was killed in 2006. The four-seat subcompact will relaunch as part of the company's new industrial partnership with Renault-Nissan. Renault is expected to build a new ForFour alongside its Twingo minicar starting in 2013.